President Obama has said that the U.S. needs to compete more effectively for exports. That is why he is calling on Congress to ratify U.S. free trade agreements with Korea, Columbia, and Peru. In the public back and forth about these free trade agreement most of the arguments are about whether the designated tariff reductions mandated by the agreements will produce jobs for U.S. workers. In fact, there is little reason to believe that they will. But, more importantly, little attention has been focused on the fact that these free trade agreements contain many chapters that have far reaching implications beyond employment numbers. In fact, the U.S. free trade agreement with Korea includes 24 chapters. One of those chapters deals with investments. In broad brush, the investment chapter establishes broad limits on the ability of governments (at all levels) to regulate or interfere with private profit seeking investments by (foreign) corporations. (h) other tangible or intangible, movable or immovable property, and related property rights, such as leases, mortgages, liens, and pledges. This chapter is supposed to secure the protection of Korean investors in the U.S. and U.S. investors in Korea. In actuality, it will ensure that Korean and U.S. investors will enjoy these protections in their own countries as well. Although this agreement does allow governments to offer foreign investors protections that exceed those they offer their own investors, it is highly unlikely that they would do so. Thus, the freedoms granted to foreign investors under the terms of this chapter will, sooner or later, be extended to domestic firms as well, thereby expanding corporate power more generally. And since, as the above list makes clear, a wide range of activities are to be protected under the terms of this chapter, it is likely that many corporations can expect to benefit from it. (g) to supply exclusively from the territory of the Party the goods that such investment produces or the services that it supplies to a specific regional market or to the world market. This protection clearly limits the ability of a government to implement any meaningful industrial policy. The chapter also grants foreign corporations protection from expropriation. According to the chapter, “Neither party may expropriate or nationalize a covered investment either directly or indirectly through measures equivalent to expropriation or nationalization.” Critical here is the notion of indirect expropriation or nationalization. (iii) the character of the government action, including its objectives and context. Relevant considerations could include whether the government action imposes a special sacrifice on the particular investor or investment that exceeds what the investor or investment should be expected to endure for the public interest. There is enough ambiguity in all of this, that one can easily imagine foreign corporations challenging many government regulations. And, if a corporation does feel that it is the victim of an indirect expropriation, this chapter gives it the power to directly sue the unit of government that has implemented the offending rule or regulation. Under the terms of the dispute-settlement mechanism, the corporation can have its claim judged under the World Bank sponsored ICSID (International Centre for Settlement of Investment Disputes) Convention and the ICSID Rules of Procedure for Arbitration, the UNCITRAL (United Nations Commission on International Trade Law) Arbitration Rules, or any other arbitration institution if it is agreed to by both parties. For example, if the ICSID is chosen to judge the claim, which is the most common choice in agreements like this, three arbitrators will be selected from a listing of international trade and investment specialists. Each side selects one with a third to be chosen by agreement of the two sides. In other words, this dispute-settlement mechanism allows a corporation to challenge a governmental action outside the legal system of the host nation and have its case decided according to terms that differ from that nation’s legal system. We already have an example of how this process could conceivably work. NAFTA has a similar investor-state dispute settlement mechanism. In 1996, The Loewen Group, a Canadian funeral home company, lost a $500 million verdict to a Mississippi funeral home business that had accused it of fraudulent business practices. Loewen appealed the case to the Mississippi Supreme Court, which refused to overturn the decision. In 1999, the Loewen Group took its case to a NAFTA tribunal, arguing that the verdict against the company should be invalidated because the court proceedings were tainted by anti-Canadian bias. Loewen asked the tribunal for compensation for what it had to pay to settle the case and for additional damages to compensate the company for the harm done to its business reputation. In its 71-page award, the tribunal . . . acknowledged that this was a difficult case. The award addressed the Loewen Group’s claims of an unfair process as well as the United States’ numerous arguments that it was not liable under NAFTA. In so doing, the tribunal chronicled the injustices suffered by the company and its founder, co-claimant Raymond Loewen. Ultimately, it found, among other things, that “the conduct of the trial judge was so flawed as to constitute a miscarriage of justice amounting to a manifest injustice as that expression is understood in international law.” The tribunal also said that the jury verdict was grossly excessive to the amounts in dispute and therefore the claimants had “strong prospects” of a successful appeal. . . .
After recounting its findings, the tribunal explained that its decision to dismiss the NAFTA claims on the merits was ultimately based on a lack of jurisdiction. It reasoned that it had no authority to determine the Loewen Group’s NAFTA claims because the company had reorganized under Chapter 11 of the Bankruptcy Code as an American corporation and then assigned its NAFTA claims to a newly formed Canadian corporation “owned and controlled by an American corporation.” NAFTA, the tribunal pointed out, was not intended to address investment-related claims by domestic investors against their government. In other words, the tribunal found it within its authority to rule on this case, even though its decision could potentially overturn a decision made by a U.S. court. And it gave strong indication that it felt that such action was justified by its reading of the submitted documents. It rejected the claim only because the Loewen Group, by reorganizing itself as a U.S. registered company, was no longer a “foreign” company and thus no longer had standing under the terms of NAFTA. If the tribunal had ruled in Loewen’s favor, the U.S. government would have been forced to compensate the company. Korean civil society organizations report that Korean government officials expressed concern about investor-state, which was characterized by Korean negotiators as a U.S. demand. The FTA text itself reveals Korea’s concerns: Korea insisted on and obtained a limitation on investor-state enforcement. Under this limitation, if a U.S. firm starts proceedings in a Korean court or administrative tribunal about a Korean policy that they claim breaches the various property rights established in the FTA, then they may NOT also use the investor-state system. U.S. firms have to pick domestic OR investor-state. USTR did NOT make that exception apply to us. . . . That the Korea government would be concerned is reasonable: there are hundreds of U.S. firms in Korea that would be newly empowered to use the investor-state mechanism to privately enforce the FTA’s extraordinary foreign investor rights that extend beyond Korea domestic law, which like U.S. law does not generally recognize compensation claims for “regulatory” takings. It seems safe to say that this investment chapter will create an environment in which governments will understandably be leery of doing anything that might be viewed as harmful to corporate activities, present or future. Make no mistake, this is the outcome desired by those who drafted the agreement. I bet you have read or heard little about this chapter, or the others that have a similar aim, in the public discussions of the U.S.-Korea FTA. And that is also no accident. It is hard to see how this agreement will serve the public’s interest in either Korea or the U.S. President Obama is pushing Congress to ratify it as soon as possible. It is very important that we push back. Our goal must be the defeat of this and the other so-called free trade agreements. The President of China, Hu Jintao, just completed a visit to the U.S. and, not surprisingly, many people used the occasion to raise the jobs issue. The U.S. economy continues to suffer from high unemployment. And the U.S. continues to run an enormous trade deficit with China, a deficit that dwarfs any other bilateral deficit. The connection made is as follows: China is an unfair trader. Its state policies, including subsidies and labor repression, are a major reason for the destruction of our manufacturing sector and jobs. This nation-state framing encourages us to see U.S. workers in direct competition with Chinese workers, with their gains largely coming at our expense. It also tends to promote a simple response: force China to quicken its embrace of market forces so that its economy will become more like ours. Unfortunately, this framing misleads more than it helps to clarify current economic dynamics. It also leads to a counterproductive response. A more accurate framing would start from the fact that contemporary capitalist dynamics have led to the creation of a regional production network in East Asia, with China serving as the region’s final assembly base for exports to the U.S. The primary beneficiaries of this development are the many multinational corporations that have created the network, and the primary losers are the majority of workers in China and the United States. The appropriate response to this development would be to build opposition to the policies that support this corporate strategy, including free trade agreements. Multinational corporations have developed a strategy to cheapen their costs of production, especially of information, technology and communication (ICT) products and electrical goods like semiconductors. This strategy involves dividing production processes into ever-finer vertical divisions and locating the separate stages in two or more countries, creating what are called cross-border production networks. The growth in this strategy is captured by the growth in the international trade in parts and components. Trade figures also make clear that multinational corporations have made East Asia the center piece of their new strategy. East Asia’s share (including Japan) of world parts and component exports grew from 27 percent in 1992-93 to 39 percent in 2005-06, despite a significant decline in Japanese exports in recent years. Developing East Asia’s share grew from 17.8 percent to 32.3 percent over the same period. In 2005-06, developing East Asia accounted for more than two thirds of the total component trade of developing countries. Disaggregating manufacturing trade into final products on the one hand and parts and components on the other shows… [that] intraregional trade in Asia is mainly concentrated in parts and components. The intraregional share of developing Asia’s parts and component trade rose by almost 20 percentage points over the past decade, reaching 62 percent in 2005-2006, as compared to an 8 percentage point increase in total trade in manufacturing over the same period. there is the cluster of highly interdependent, open, and vibrant economies in East Asia and Southeast Asia . . . . With the PRC at the center of the assembly process and with exports going mainly to the U.S. and Europe, production in and trade among these economies have been increasingly organized through vertical specialization in networks, with intense trade in parts and components, particularly in the ICT and electrical machinery industries. The share of parts and components in China’s imports of manufactures from East Asia rose from 18 percent in 1994-1995 to 46 percent in 2006-2007. The import share of parts and components in the machinery and transportation equipment category (which includes both ICT and electrical goods) soared over that same period from 46.1 percent to 73.3 percent. China’s unique position as the region’s production platform for the export of final goods is highlighted by the fact that it is the only country in the region that runs a deficit in parts and components trade, and whose exports are overwhelmingly final products. It is this unique position that has enabled China to increase its share of world exports of ICT products from 3 percent in 1992 to 24 percent 2006, and its share of electrical goods from 4 percent to 21 percent over the same period. Of course, these are not truly Chinese exports, but rather exports produced in China. Approximately 60 percent of all Chinese exports are produced by foreign corporations; the share is 88 percent for high-tech goods. even though intra-Asian trade has been expanding more rapidly than Asia’s trade with the rest of the world, Asia has become ever more closely linked by globalization to the major global markets of the G3 [the United States, EU, and Japan]. This stems from the nature of Asian trade, with intra-Asian trade driven by vertically integrated Asian production chains and extra-Asian trade driven by G3 demand for the final goods produced in these networks. The rapid growth in the region’s dependence on the G3, and the U.S. market in particular, is well captured by the following trends: the correlation between the growth in East Asian intraregional exports and U.S. non-oil imports increased from .01 during the 1980s, to .22 during the 1990s, and .63 during the first half of the 2000s. Similarly, the correlation between the growth in East Asian exports and G3 non-oil imports rose from .21 during the 1980s, to .34 during the 1990s, and .77 during the first half of the 2000s. Drawing on the above, we can better understand why China now looms so large in U.S. trade discussions. The rest of East Asia has largely stopped producing final goods for export to the U.S., producing instead parts and components for export to China. China, in turn, has also become increasingy export oriented, producing the final products destined for sale in the U.S. market. As a result, our trade deficits with other East Asian countries have fallen while our trade deficit with China has increased. China is the face of a broader multinational corporate dominated East Asian production system. In other words, our economy is being restructured in line with the economies of East Asia. We are being reshaped, just like East Asia, by a multinational corporate strategy, which also is supported by large U.S. firms. As noted above, approximately 90 percent of China’s high technology exports to the U.S. are produced by multinational corporations and many of them are being bought and sold in the U.S. by other multinational retailers. Working people in China are struggling in the face of multinational corporate demands that the Chinese government keep wages low and working conditions profitable. And workers in other East Asian countries are also suffering as their governments are forced to implement similar repressive labor policies in order to keep multinational corporations producing in their countries. In short, Chinese workers are not stealing our jobs. Rather working people in East Asia and the U.S. are suffering from very similar pressures being generated by the very same dynamic. Said more simply, our problems are at root caused by contemporary capitalist dynamics. Forcing China to become more open to capitalism is not going to help us or them. Of course, this is a framing that the media and business and corporate elite are not eager to promote. Better that we think our system is great and that the problem is that the Chinese government has not yet fully committed to promoting a similar one. Labor conditions are terrible. We all know it but here is a telling illustration from a Wall Street Journal article of just how bad things are. The chart below shows what has happened to full time workers who lost their jobs between January 2007 and December 2009 after holding them for three or more years. As you can see, fewer than half of these workers have found new employment. And of those who were lucky enough to get new full time employment, the great majority were forced to take a significant pay cut. Many economists, always anxious to defend capitalism, are now arguing that we have high unemployment rates not because we are suffering an economic crisis but rather because we have a skills-mismatch. In other words, corporations want to hire, it is just that workers don’t have the skills that the corporations need. Said differently, the system is fine–it is the individuals that need correction. The skills-gap message is coming from many quarters. Policymaker-in-chief Obama told Congress in February 2009: “Right now, three-quarters of the fastest-growing occupations require more than a high school diploma. And yet, just over half of our citizens have that level of education.” His message: workers need to go back to school if they want a place in tomorrow’s job market. . . .
Economists and other “experts” are most likely the source of the skills-gap story. Last August, for instance, Narayana Kocherlakota, president of the Federal Reserve Bank of Minneapolis, wrote in a Fed newsletter: “How much of the current unemployment rate is really due to mismatch, as opposed to conditions that the Fed can readily ameliorate? The answer seems to be a lot.” . . . The skills-mismatch explanation has a lot to recommend it if you’re a federal or Fed policymaker: it puts the blame for the economic suffering experienced by the 17% of the U.S. workforce that is unemployed or underemployed on the workers themselves. Even if the Fed or the government did its darndest to boost overall spending, unemployment would be unlikely to subside unless workers upgraded their own skills. The only problem is that this explanation is basically wrong. The weight of the evidence shows that it is not a mismatch of skills but a lack of demand that lies at the heart of today’s severe unemployment problem. President Obama’s claim that new jobs are requiring higher and higher skill levels would tend to support the skills-gap thesis. His interpretation of job-market trends, however, misses the mark. The figure that Obama cited comes from the U.S. Department of Labor’s employment projections for 2006 to 2016. Specifically, the DOL reports that among the 30 fastest growing occupations, 22 of them (75%) will typically require more than a high school degree. These occupations include network systems and data communications analysts, computer software engineers, and financial advisors. What he fails to say, however, is that these 22 occupations are projected to represent less than 3% of all U.S. jobs. What would seem more relevant to the 27 million unemployed and underemployed workers are the occupations with the largest growth. These are the occupations that will offer workers the greatest number of new job opportunities. Among the 30 occupations with the largest growth, 70%-21 out of 30-typically do not require more than a high school degree. To become fully qualified for these jobs, workers will only need on-the-job training. The DOL projects that one-quarter of all jobs in 2016 will be in these 21 occupations, which include retail salespeople, food-preparation and food-service workers, and personal and home care aides. In fact, the DOL employment projections estimate that more than two-thirds (68%) of the jobs in 2016 will be accessible to workers with a high school degree or less. Couple this with the fact that today, nearly two-thirds (62%) of the adult labor force has at least some college experience, and an alleged skills gap fails to be convincing as a driving force behind persistent high unemployment. If employers were having a hard time finding qualified workers to fill job openings, you’d think that any workers who are qualified would be snapped right up. But what the unemployment data show is that there remains a substantial backlog of experienced workers looking for jobs or for more hours in their existing part-time jobs in those major industries that have begun hiring-including education, healthcare, durable goods manufacturing, and mining. 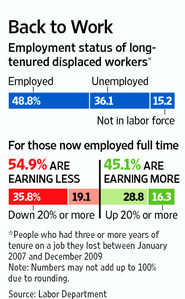 Most telling are the underemployed-those with part-time jobs who want to work full-time. Today there are more underemployed workers in each of the major industries of the private economy than during the period from 2000 to 2007, as Arjun Jayadev and Mike Konczal document in a recent paper published by the Roosevelt Institute. Even in the major industries with the highest number of job openings-education and health services, professional and business services, transportation and utilities, leisure and hospitality, and manufacturing-underemployment in 2010 remains at levels twice as high or nearly twice as high as during the earlier period (measured as a percentage of employed workers). Purveyors of the mismatch theory would have a hard time explaining how it is that underemployed workers who want full time work do not possess the skills to do the jobs full-time that they are already doing, say, 20 hours a week. This kind of theorizing means that the administration is just not ready to take this crisis seriously. And that may be because although working people are suffering, profits are soaring. The US-Korea Free Trade Agreement (FTA) is back on the US political agenda. Signed in June 2007 by the governments of the two countries, it has yet to be ratified by either the Korean National Assembly or the US Congress. Although social movements in Korea have waged a militant campaign against ratification in their country, opposition to the agreement by key members of the U.S. Congress appears to have been the main reason for the non-action. If Congress had approved the agreement, the Korean National Assembly would have likely followed. Congressional opponents of the US-Korea FTA claimed to be motivated by industry and labor concerns that the agreement did not do enough to protect US jobs. The automobile industry (in particular Ford), joined by the UAW, was especially vocal in demanding changes to the agreement. Given that South Korean political leaders refused to reopen negotiations, there appeared little chance that the FTA would ever be ratified. But things have changed. President Obama, under intense pressure to boost employment without further deficit spending, has now embraced an export-led jobs strategy. In his January 2010 State of the Union address, he called for doubling exports over the next five years, an increase, he claimed, that would create two million jobs. Achieving this goal, he added, required, among other things, approving the US-Korea FTA. Demonstrating his commitment to his new strategy, he created a new export-promotion council composed of 20 major business leaders, including the CEOs of key transnational corporations such as Boeing, Pfizer, Ford, and UPS. Beginning in July 2010, the US government began pressing South Korea to make changes in the agreement. The South Koreans capitulated and, in December, both governments announced new ground rules for the auto trade, which involved concessions to the U.S. auto industry. Now, Ford is on board with the agreement, and so is the UAW. It remains to be seen what Congress will do. The tariff cuts alone in the US-Korea trade agreement will increase exports of American goods and services by $10 to $11 billion. We expect this agreement to create 70,000-plus jobs for American workers in a wide range of economic sectors from autos and manufacturing to agriculture. But where do the figures come from—and how much confidence should we have in them? Thanks to the Eyes on Trade Blog, we can answer those questions. But there is a big problem with this reasoning. For one thing, this calculation does not include the effect of imports (which cost jobs). If we were to account for the effect of imports on jobs using this same methodology, some 60 percent of the bilateral job gain is erased. But there is another problem. The USITR got its predicted trade figures from a complex modeling exercise that incorporates all changes in US trade that might result from the US-Korea FTA. As it turns out, some of the increase in US exports to Korea is actually the result of trade diversion. In other words, not all of the increase in US exports to Korea means new jobs. [Overall] U.S. exports in the sectors analyzed will increase by $4.8-5.3 billion, but imports will increase by $5.1-5.7 billion due to the Korea FTA. This leads to a net increase in the deficit of between $308 million and $416 million. The “$10 to $11 billion” figure that Kirk is citing refers to the increase in exports to only Korea, but does not account for declines in U.S. exports to other countries that the FTA will induce. Because of the way that bilateral trade agreements affect global trade flows, about 50% of the increase in exports to Korea are merely U.S. exports to third countries shifting to Korea. In other words, 50% of the “$10 to $11 billion” does not represent new exports, only exports that have changed destination. In fact, the USITR’s own study suggests that the overall US trade deficit will actually grow if the US-Korea FTA is ratified. Thus, if we use the government’s own methodology we can only conclude that things will get worse job wise, rather than better. The truth is that the US administration has no idea what this agreement will mean as far as jobs are concerned. And they apparently don’t care. The main goal of this agreement is to help the US financial, services, and medical goods sectors make profits by giving them ever greater freedom to internationalize their operations. If the agreement is ratified, these industries will become stronger and our unbalanced economy will become only further unbalanced. And we wont be doing Koreans any favor either. This FTA should not be ratified.